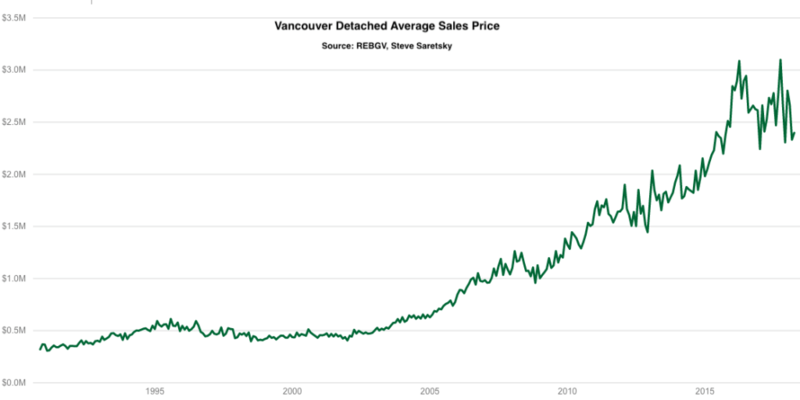 The Vancouver detached housing market appears to have skipped the historically busy spring market. Following a miserable first quarter, with just 352 sales from January 1st to March 31st, eroding the previous low set in the first quarter of 2009, home sellers held their breath for a spring turnaround. However, those hopes were dashed, with April home sales ticking in at their lowest levels in recent history dating all the way back to 1990. There were just 173 detached home sales in the city of Vancouver this April. This marked a 31% decline year over year. The fewest home sales for the month of April per the Real Estate Board of Greater Vancouver MLS data. Vancouver Detached Home sales for the month of April. While home sellers have been reluctant to slash prices it appears those who need to get out are having to take a haircut. The average sales price of a detached home sunk 5% year over year in April, dropping to $2,397,464. Average sales price for Vancouver detached homes as of April, 2018. There appears to be a rather obvious downwards trend after prices re tested previous highs back in 2017. The combination of a mortgage stress test and higher interest rates appear to be choking off would be buyers from the expensive detached housing segment. Three big Canadian banks, including, CIBC, RBC and TD all moved mortgage rates higher last week. Perhaps even more importantly, the well of foreign capital appears to have run dry. This might be best exemplified in the Richmond housing market where foreign buyers are the most prevalent, once making up nearly 20% of all transactions in 2016. The affluent city of Richmond registered just 63 detached home sales, marking a 59% decline year over year, and the worst April on record. With a speculation tax en route, expect to see even more sellers.